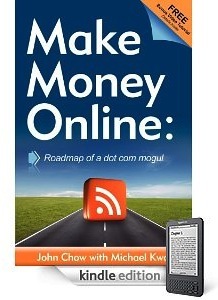 Make Money Online: Roadmap of a Dot Com Mogul, the book that I wrote with Michael Kwan, is now available on the Amazon Kindle. Not only can you read it on Kindle but Amazon has it on sale for only $7.99! I guarantee you the book will provide far more than $7.99 of value. You do not need to have an Amazon Kindle in order to read the book because Amazon has a free Kindle reading App for your PC, Mac, iPhone, iPad, BlackBerry, and Android phone. Just download the app to your device, purchase the book at Amazon and have it wireless delivered to your smart phone, iPad, Mac or PC. It only a few minutes. If you have an Amazon Kindle or just like reading book in eBook format to be more environmentally friendly, then you’ll want to add a copy of Make Money Online: Roadmap of a Dot Com Mogul to your Kindle library. Blogs. They may have once been the realm of personal online diaries, but blogs have quickly become just as legitimate and influential as mainstream newspapers and magazines. Did you know that you can make a very healthy income from blogging? Do you want to make five figures every month? I can show you how. My personal blog consistently makes over $40,000 a month. In this book, I describe exactly how I went from earning $0 to over $40,000 a month from just a couple of hours each day. I’ll walk you through the process, step by step, uncovering all the secrets that other pro bloggers are too afraid to tell you. What are you waiting for? Get out of the rat race and into the blogosphere!